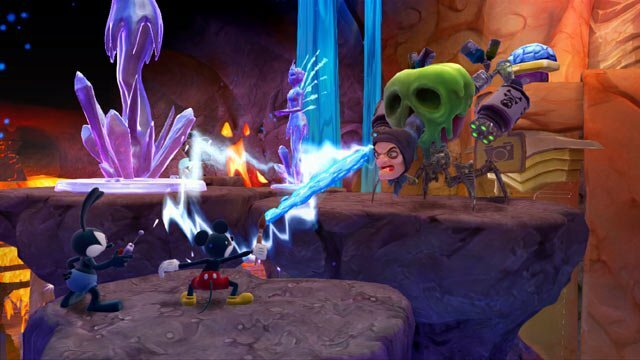 Epic Mickey 2 is perhaps the most disappointing game of the year. Instead of fixing problems with the original, the devs decided to take on an entirely new direction. As the credits rolled and my time with Epic Mickey 2 ended, I turned off my console, gently set the Wii U GamePad on its charging stand, and sat in silence as I fought back tears. Tears, not because the game I had just finished was beautiful and memorable, but because all of my excitement to return to Wasteland and accompany Mickey through yet another nostalgia-filled adventure was completely shattered by reality. This wasn’t the game I was looking forward to. This was…something else. This game was horrible. What on Earth went wrong? Regular readers should already know how close I am to Disney and all of the things that made it great so many years ago. If not, my review of the 3DS version of the game, with an added layer of nostalgia due to the fact the game looks like a Genesis title, can attest to my Disney nerddom. 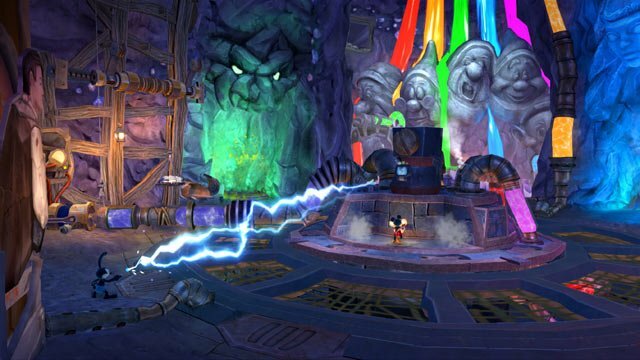 Epic Mickey 2 might have been my most anticipated game of the season due to this fact, but all the excitement in the world can’t make Epic Mickey 2 any less of a badly designed game. Before I begin picking the game apart, I invite you all to check out our review of the other console versions of the game. Chad went in-depth with the game as well, and found some of the mechanics frustrating and annoying, the atmosphere boring and lacking all of the classic Disney charm we’ve all come to expect from the game. I agree with his review 100 percent. As such, this review will focus on the differences between the Wii U version and the other console versions. Immediately upon beginning the game it’s apparent the aiming issues found in the HD console versions are still here. It’s clear that the game was originally conceived on the Wii. Aiming controls are impercise and frustrating to deal with using control sticks, and will make even the most anti-motion control gamers beg for a Wiimote to use to aim. Especially when players will start losing most of their paint and thinner reserves to missed shots. But hey! The Wii U supports Wiimotes. You can probably just use that for control instead of the GamePad, right? Well…no. Player 1 is locked into using the GamePad. Wiimotes are only permitted if a player 2 jumps in to control Oswald. This is a particularly confusing design choice given that there’s really nothing special about what you can do with the GamePad. You’ve got a map on the screen, and an objective on the bottom, but that’s really about it. It reeks of wasted potential, or at least like you should have had the option to use a slightly better control scheme. Control woes are only half the technical battle, sadly, as the Wii U version is plagued with framerate problems. You can try to convince yourself it’s supposed to be that way in homage to old movies, the kind that looked like giant lighted flipbooks, but even that won’t keep it off your mind for long. The game at least looks as good as the HD counterparts. If you’re not playing with a friend, I also feel sorry for you. Oswald’s AI is atrocious. Often you’ll need to rely on him to cross a chasm or hit a button. You’ll be patiently waiting by your side, hitting the button to get Oswald to pay attention. “I got it!” He’ll say cheerfully, only for you to turn around and realize he’s not moving. Given that Epic Mickey 2 has a new focus specifically on co-op gameplay, this is really, REALLY infuriating. 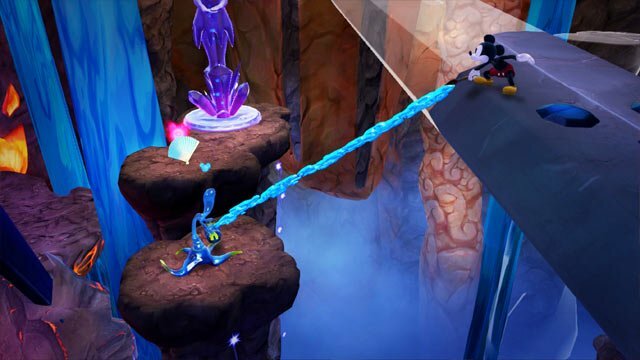 Perhaps the biggest thing working against Epic Mickey 2 is the overall feeling of emptiness. Sure, much of the game is slightly redesigned levels from the first game, but all the personality and charm that made the original game so endearing is strangely missing. The characters have voices now, and there are now musical numbers that even a few of the characters appear to be annoyed at, but this doesn’t feel like it’s dripping with as much Disney history as the original did. Part of this is no doubt due to the transition levels. In the previous game when moving from one area to the next, players were placed into a 2D platforming segment based on an old Disney classic short. Now it’s simply a pile of old Disney memorabilia, most of which aren’t recognizable whatsoever. It’s like navigating that pile of junk sitting in your attic, but being the size of…well…a mouse. It’s like what Junction Point decided to do was fix one or two things that were complained about with the original game, and decided instead of fixing everything and making this a truly masterful game, they’d tack on a half-hearted co-op mechanic instead. Going in a new direction is only a wise idea when you’ve got the base idea right in the first place. It’s not like the co-op mechanics are even all that necessary to the story. Somehow the game doesn’t know how to focus between two main characters. Mickey gets top billing for sure since he’s, you know, Mickey Mouse, but the game becomes somewhat bipolar by trying to focus on Oswald’s life after the events of the last game and Mickey being the hero once again. It’s even more confusing given that the characters are literally in the exact same few square feet of each other for the entire length of the game. Why on Earth are we struggling to figure out how to balance two stories when we should just be focusing on the here and now? 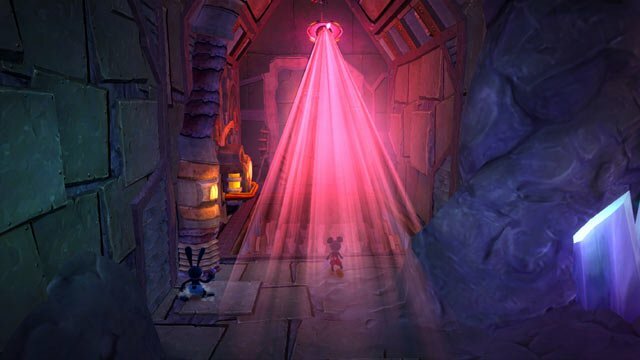 I can’t begin to describe how disappointed I am with Epic Mickey 2. It’s difficult to figure out where things went wrong. All that really needed to be done with the original was a bit of HD polish, voice overs and a better camera; throw in a new story and you’re golden. That’s not what we got. We got a game that tried to do something new while leaving many of the problems of the first game unresolved. You can’t, in good faith, build something extravagant on a foundation that’s already shaky if you want to finish and hope to have people praise your work. Clearly someone at Juntion Point needs to learn that.